You will be given a reference e-book to read which has 110 pages And the test will be based on that e-book , you can take final test within 1 year of purchase. What is Quality and Operations Management? Quality and operations management refers to a process which primarily aims to help business organizations in staying competitive in the global market by improving the quality of the products and services that they provide as well as their operations. If you are a business owner, then you should know how important it is to hire a proficient and competent certified quality and operations manager especially when trying to achieve success. By effectively implementing the quality and operations management process, you will find it easier to realize and utilize the potential of your business. You will have an easier time competing in the somewhat competitive industry that you are in because you can start introducing new and high quality products into the international markets. This is possible because you will know exactly how you can improve your existing products, services and processes. It should also be noted that the major objective of quality and operations management is to effectively support business organizations especially its staff in generating the required skills and knowledge that are useful in efficiently managing, transforming and improving organizational processes. You can also expect this approach to work in your attempt to carefully manage processes as a means of continuously producing and distributing high quality products and services. Quality and operations management can also play a major role in effectively creating, developing, producing and distributing high quality products that are sure to satisfy your millions of present and potential customers. 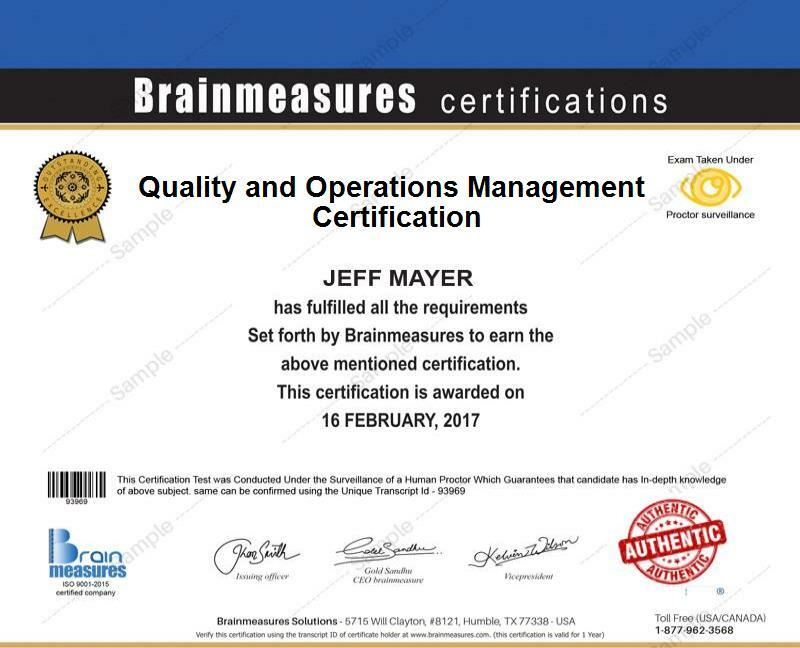 The quality and operations management certification program which is now available at a highly reputable online certification company known as Brainmeasures is the most ideal course for you if you have longed to become a real expert in implementing the quality and operations management process. This quality and operations management course offered by Brainmeasures is highly beneficial because aside from its effectiveness in supplying you with all relevant data regarding the field, you can also expect it to work in your attempt to improve your proficiency and competence in the field. Enrolling in this certification course gives you the opportunity to enjoy the company’s quality and operations management training which is guaranteed to help you master all the relevant terms and concepts associated to the process, its scope, history, major functions and objects, the most effective quality and operations management tools and techniques that you can use and how you can make the most out of the process. Earning a quality and operations management certificate is rewarding because of its effectiveness in proving to the public that you have enough skills and knowledge in this specific field. How to effectively execute the capacity and inventory planning and control process? Brainmeasures quality and operations management certification program is proven to be beneficial to a lot of individuals and professionals who wish to improve their career. It targets chief executives, managers, VP of manufacturing, VP of logistics, operations managers, engineers, consultants, specialists and any other individuals and professionals who are in charge in effectively managing the operations of a business organization and in ensuring that high quality products and services are developed. Completing a quality and operations management certification course is also rewarding because of its usefulness in increasing the salary that you regularly receive. With the help of your quality and operations management certification, you can work as a quality and operations manager which gives you the opportunity to receive around $56,000 to $91,000 per year. Working as a quality and operations management consultant is even more rewarding considering the ability of this profession to let you receive as much as $157,000 annually.